A vigorous grower and an excellent rebloomer. A late bloomer, great for extending your bloom season. 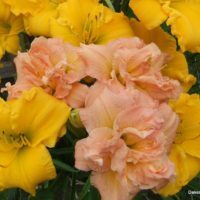 I go through many stages of love with daylilies. Last year was spiders, but this year has been doubles and bigs. I honestly did not think Dublin Elaine was going to bloom. I have an Irish friend whose name is Elaine, and I really wanted her to bloom, but was losing heart. I saw the scapes start, and then the blooms. Gorgeous. Beautiful all the way to the slightly yellow and then slightly green interior. She has so many doubles as well. End of the season daylilies just lift your heart when you know the summer is coming to an end, and Dublin Elaine will do it. I say to the people who only get green scapes, move her to a different place with slightly different soil and see what happens. I did, and she was worth it all. Like i said, this gal looked really tall to me so i just went out and measured. The tallest flowers stand 39″ tall and the others aren’t far behind. 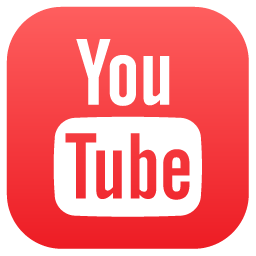 Hope this is helpful in your placement. Planted facing north, but gets plenty of sun. Also, just counted 32 more buds on 5 scapes. Totally impressed, as are my neighbors. You’ll enjoy her!!!! Well, this very feminine lass of a flower did take her time in my Zone 6a garden to bloom (planted in Spring 2015 and got my first blooms about 2 weeks ago), but the wait was rewarded with a profusion of beautiful blooms and still sporting more buds on taller than expected scapes. With the beautiful blend of pastel petals, she makes quite the stately, but still airy , picture of perfection. I can see her just getting more exceptional with age. Thank you, Oakes, for this stunning bonus plant!!! Planted Dublin Elaine in the spring of 2016, and this daylily developed some nice green leaves. This spring (2017) I had hopes for some nice flowers, but was surprised to see nothing but green leaves. 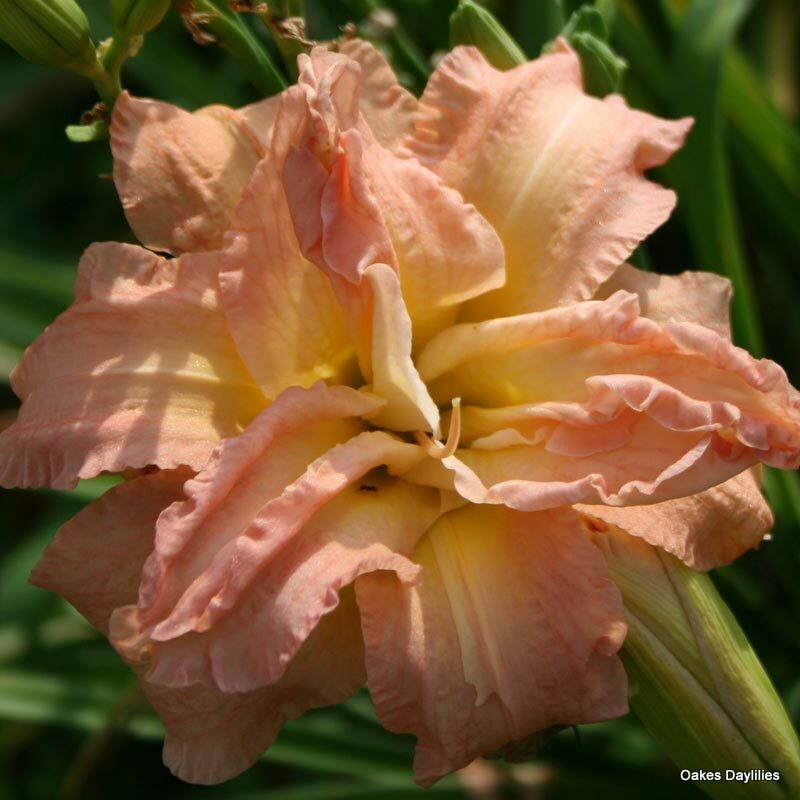 Now most of my other daylilies have completed their blooming, but no scapes or buds forming with Dublin Elaine. 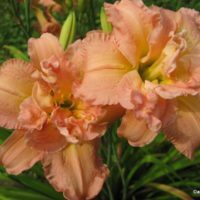 Other Oakes daylilies purchased at the same time as Dublin Elaine, including Tuscawilla Tigress, Miss Amelia, and Orange Tremor, have adjusted to their being planted in the same area as Dublin Elaine and produced nice blooms. I’m not sure whether Dublin Elaine will ever produce any blooms – disappointing. Was not sure of this one at first. Received as a bonus plant twice. She was a little slower to start for me, and was just not sure of how a well of a performer she would be. Have completely been won over. This plant gets better and better. Second year of bloom and am seeing consistent rebloom. The tall spikes hold beautiful double flowers with wonderful shading of colors. Planning more places to put this beauty. 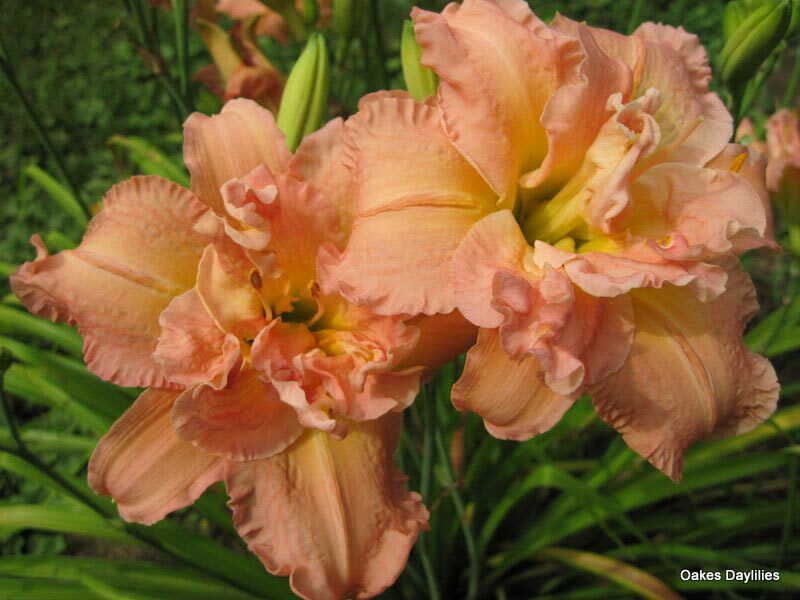 Double daylilies are not normally my favorites but since receiving ‘Dublin Elaine’ as a bonus plant, I’m a convert. I planted this in a less than optimal location just because I didn’t have any other place at the time. Well, it not only survived but is blooming very well and consistently produces double blooms. A lovely pink-peach with yellow as described, I will be moving these into a prime location in my flowerbeds later this year so we can better enjoy them! This is a stunner. Planted on the east side of the Palos Verdes Peninsula, (Southern California) the plant is about 3 years old. Last year I divided it and all three plants are thriving. The mother plant is covered with blossoms and buds. The babies also have flowers. The color is a soft pink and the blooms are so ruffled! This one is a keeper. I live in Zone 9a in South East Coastal Texas, the last place I would think this lily would thrive. BUT it does. I just ordered 2 more. 1st year for this one in my garden. It is truley beautiful,can’t wait for next year’s showing with more scapes,altho it did well for the first year.Love it!! very pretty! 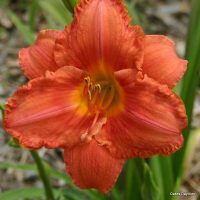 A stunning daylily that has such vigor and tremendous blooms. It’s a standout in my garden not only because of beauty but from its height and ability to blend well with other plants. I’m in love again! Dublin Elaine has stolen my heart. I had forgotten about planting it, and was expecting another bloom, but when it opened I almost fell over at it’s beauty. It has bloomed continuously for 5 weeks and still has more to go. The bloom itself is breathtaking! How many favorites can a person have?? 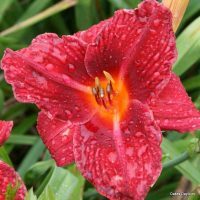 OH MY GOODNESS, THIS DAYLILY IS HEAVEN!!! It’s so absolutely gorgeous, huge pink and yellow blooms so ruffly and lovely!! 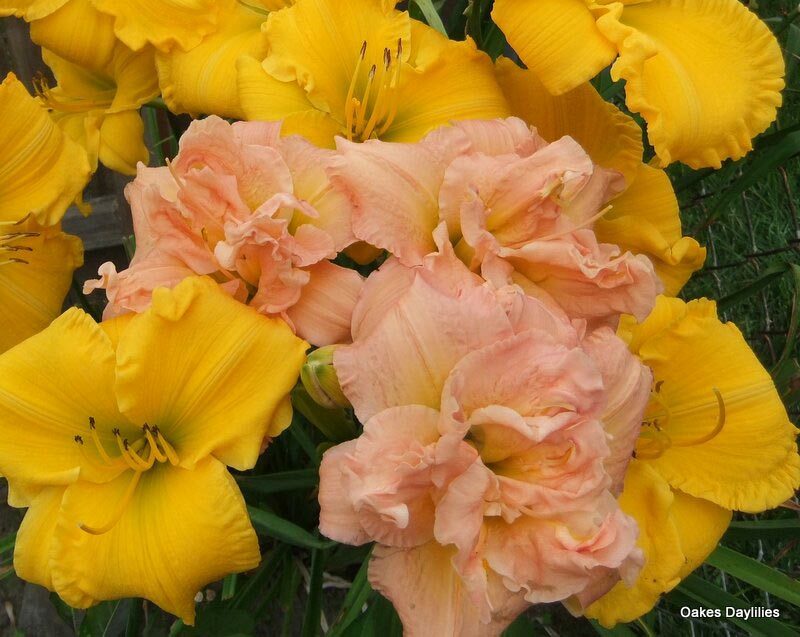 And lots of blooms with great increase too, I’m just loving this daylily. You can’t go wrong with this one, it’s a showstopper for sure!! Lovely colors in this one’s blossoms. In the beginning of its bloom season here in central Ohio. This Daylily is spectacular. I don’t remember it reblooming last year but, this year when it started to bloom I noted that I had to stalks that were loaded with buds, I looked at it today and saw that it was still loaded with buds then realized that I now had 8 stalks, one had just produced its last bloom and 2 others were getting closed to being done but the others were loaded. So this isn’t a rebloomer it seems to be a continuous bloomer! Received this one as a free one a few years ago. I love the color! Very pretty and bright. WOW, is Dublin Elaine a stunner! In June 2010, after a cool Southern California Spring, Dublin Elaine is covered with beautiful peachy pink, fully double flowers. Dublin Elaine is growing in half-day sun (coastal) and thriving – a healthy, vigorous plant. Highly recommended for Southern CA coastal gardens. Dublin Elaine bloomed last summer for the first time. I was impressed by its beautiful vivid pink color and its ablilty to be 100 percent double. 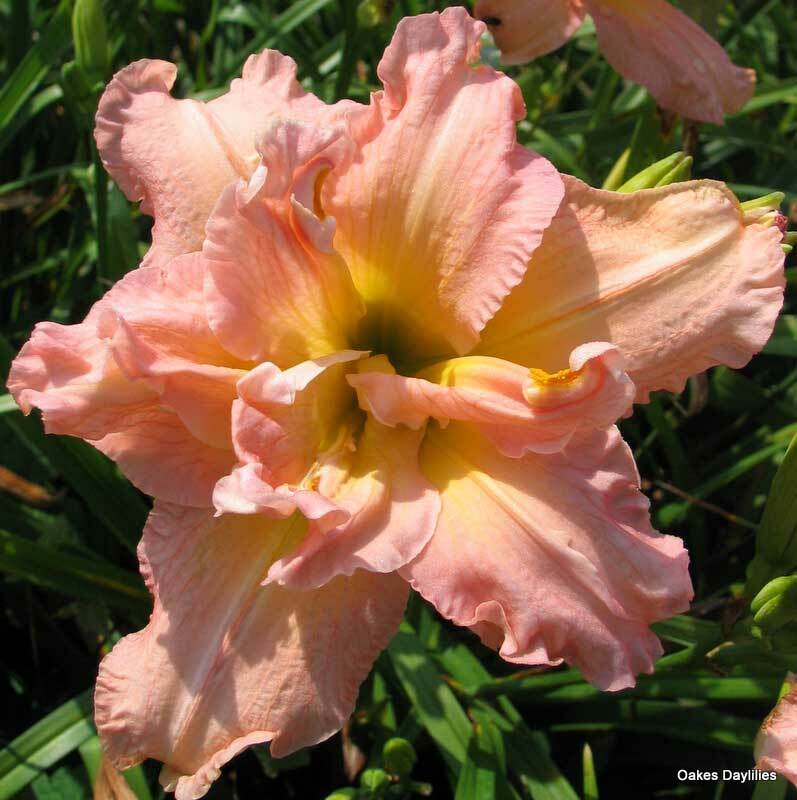 Of the over 300 daylily varieties I own, I only have two other pink doubles. That makes Dublin Elaine a rare find and very special. I revamped a small bed last year. I planted 9 Dublin Elaine plants just hoping for the best because this bed only gets a half day of sun. 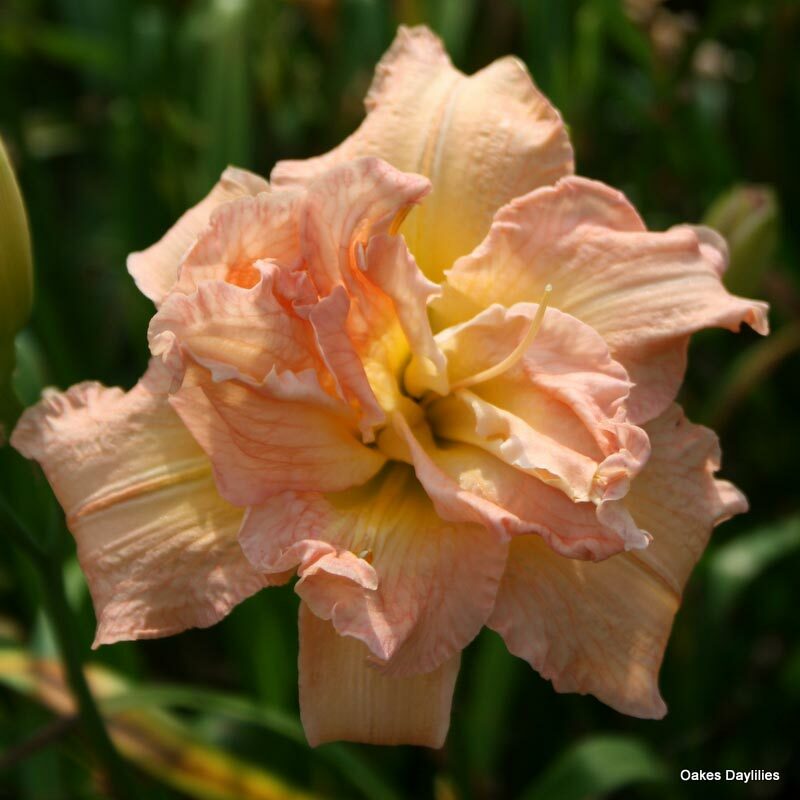 Wow, this daylily really out-performed my expectations-beautiful and plentiful blooms. Here it is in February, and the plants are up about 2 inches. I can’t wait to see their display after being in the ground for a full year! 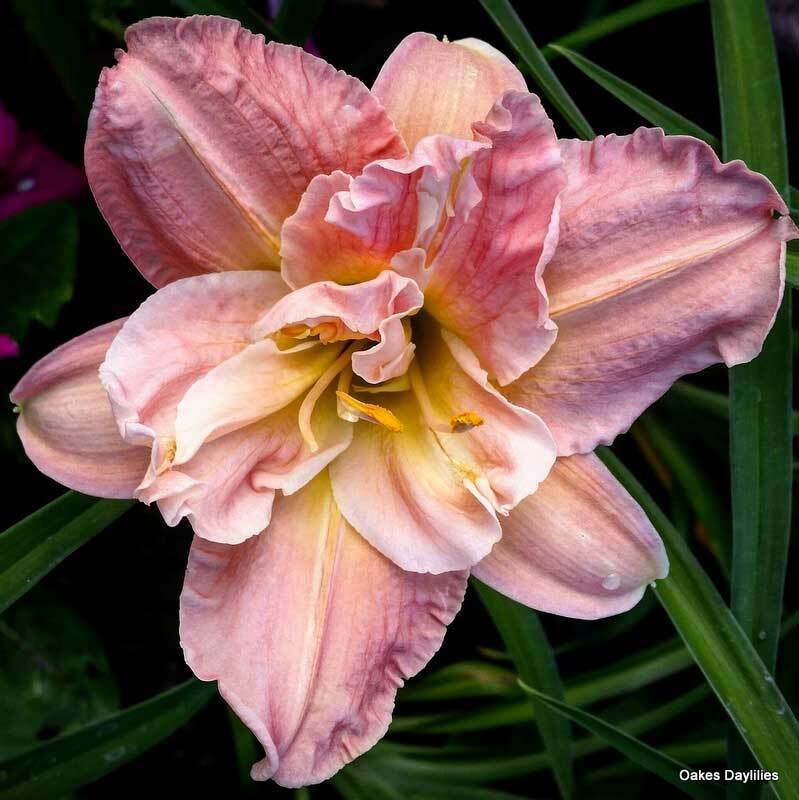 No wonder this daylily is an award winner. In its first year of growth, its numerous and showy blooms have been impressive. With our cool night temperatures, the colors (a blend of coral, pink and gold) have been especially vivid. Despite drought conditions, my Dublin Elaine bloomed consistently for almost 3 full months this summer. She has been in the gound here for three years and I love her more each year. 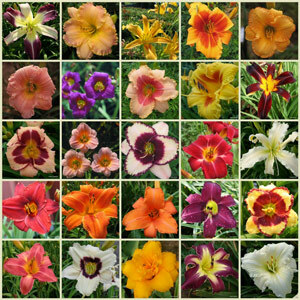 The perfect daylily selection! 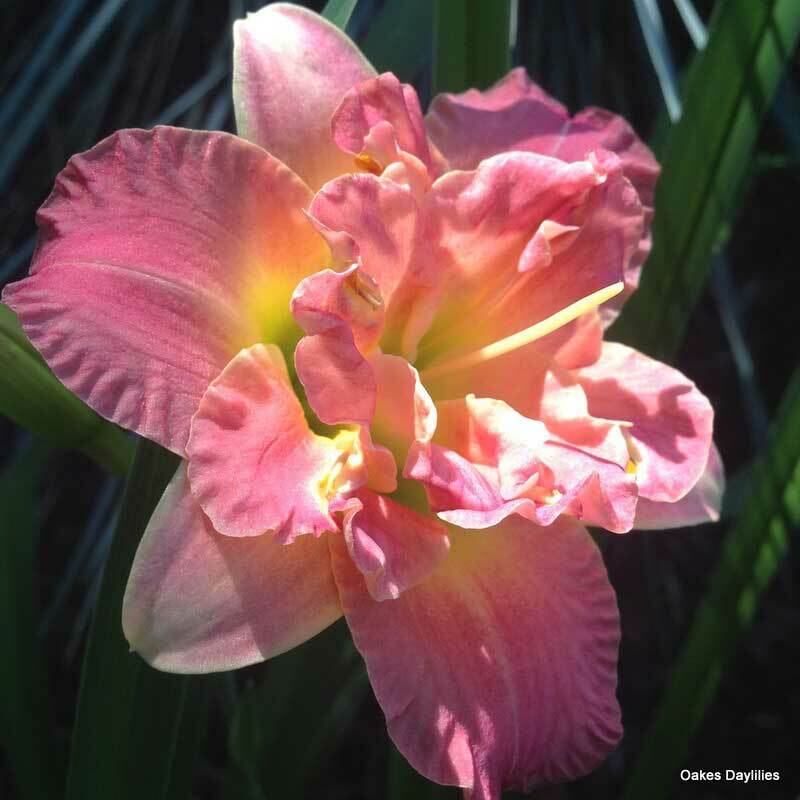 Fabulous daylily, it is beautiful and reblooms faithfully. I love it and think all doubles are special, this is such a wonderful color combo. This is my first year with this one. I can’t believe the number of blooms on this plant. The picture truly doesn’t do it justice. They are the most beautiful daylily I’ve ever seen and easily my all time favorite. 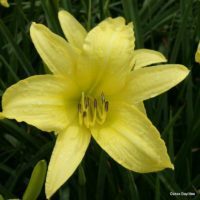 I have grown this daylily for years now. They even survived my dog digging them up (no blooms that year). This year is their crowning glory! I really believe the picture doesn’t do them near enough justice. They are positively yummy! I wish I had hundreds of them!! 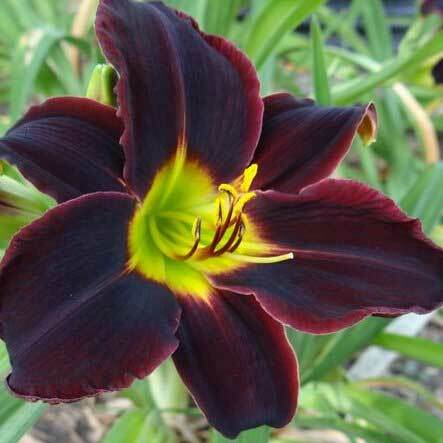 This is a wonderful daylily. Last year, mine bloomed from June until September.